Zero-packaging stores show, in their own small way, a viable and healthier alternative to the current system. Both for ourselves, local economies and the planet. Wrapped, sealed, boxed, cling-filmed and vacuum packed. We have become used to consumables being packaged in every way imaginable. The history of “packaging” goes back to the first human settlements. First leaves, gourds and animals skins were used. Then ceramics, glass and tin. Then paper and cardboard. But with the invention of plastic and the celebration of “throwaway living” since the 1950s, the environmental costs of an overpackaged world have become manifest. Plastic now litters the planet, contaminating ecosystems and posing a significant threat to wildlife and human health. Food and beverage packaging accounts for almost two-thirds of total packaging waste. Recycling, though important, has proven an incapable primary strategy to cope with the scale of plastic rubbish. In Australia, for example, just 11.8% of the 3.5 million tonnes of plastics consumed in 2016-2017 were recycled. 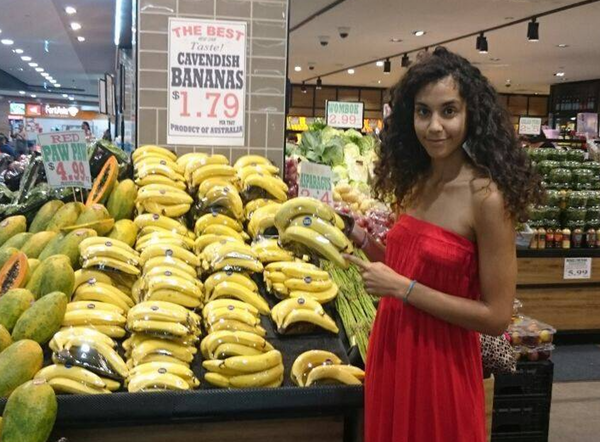 Initiatives to cut down on waste can initially be strongly resisted by consumers used to the convenience, as shown by the reaction to Australia’s two major supermarket chains phasing out free single-use plastic shopping bags. But after just three months, shoppers have adapted, and an estimated 1.5 billion bags have been prevented from entering the environment. Can we dispose with our disposable mentality further, by doing something to cut down on all the packaging of our food and beverages? The emergence of zero-packaging food stores is challenging the idea that individually packaged items are a necessary feature of the modern food industry. These new businesses demonstrate how products can be offered without packaging. In doing so they provide both environmental and economic benefits. 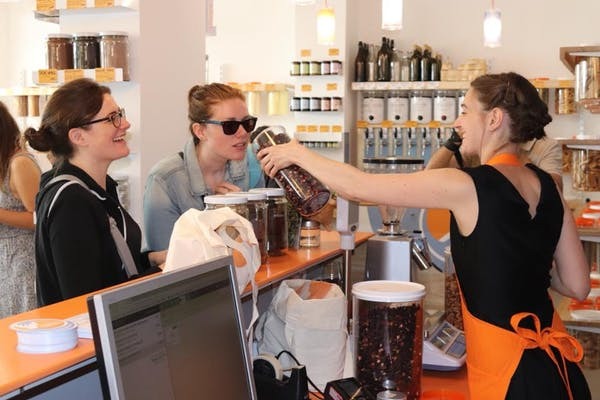 Zero-packaging shops, sometimes known as zero-waste grocery stores, allow customers to bring and refill their own containers. They offer food products (cereals, pasta, oils) and even household products (soap, dishwashing powder). You simply bring your own jars and containers and buy as little or as much as you need. These stores can already be found in many countries across the world. They are more than just individual trading businesses making a small difference. They are part of an important and growing trend promoting an environmentally sustainable “reuse” mentality. Their way of doing business shows we can change the current ‘linear’ economic system in which we continuously take, make, use and throw away materials. Food packaging is part and parcel of a globalised food market. The greater the distance that food travels, the more packaging is needed. Zero-packaging stores encourage sourcing locally. They can therefore play an important role in enhancing local economy and supporting local producers. They can help break globalised agribusiness monopolies, regenerating the diversity of rural enterprises and communities. The book Home Grown: The Case for Local Food in a Global Market illustrates the benefits of reclaiming back the food industry. Packaging also contributes to another problem with the current industrialised food system. It doubles as an advertising tool, using all the psychological tricks that marketers have to persuade us to buy a brand. These strategies appeal to desire, encouraging people to buy more than what they really need. This has arguably exacerbated problems such as obesity and food waste. It has given multinational conglomerates with large marketing budgets an advantage over small and local producers. Not all of packaging is wasteful. It can stop food spoiling, for example, and enables us to enjoy foods not locally produced. But what is driving the growth of the global food packaging market – expected to be worth US$411.3 billion by 2025 – is rising demand for single-serve and portable food packs due to “lifestyle changes”. Most of us recognise these are not lifestyle changes for the better; they are the result of us spending more time working or commuting, and eating more processed and unhealthier food. While these shops are still niche, governments interested in human and environmental health can help them grow. Bans on plastic bags point to what is possible. How easily we have adapted to no longer having those bags to carry food a few metres to the car and then to the kitchen show that we, as consumers, can change our behaviour. We can choose, when possible, unpacked products. There is, of course, a small sacrifice in the form of convenience, but we just might find that we benefit more, both personally and for a greater environmental, economic and social good. Right on, right on, right ON! As one battling the proposal for a new petrochemical hub along the entire western border of my state of WV, the Ohio River (and there are also plans to expand Cancer Alley #1 in Louisiana), I welcome the help from those who realize we need to stem the flow of plastic, not produce more.